1. Enter the pickup and drop off zip codes, Your estimated move size & your contact information. 2. Our system locates the best movers with a cargo van or truck near you. 3. Get free moving quotes and book the best offer. 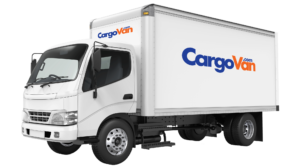 Booking a Cargo van with movers can be cheaper by up to 60% on state to state moves. 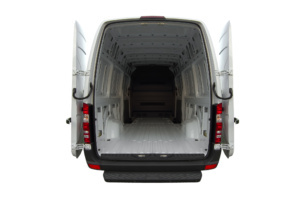 How Many Cubic Feet is a Cargo Van? The average cargo van is about 490 cubic feet of space which is great to move furniture or general cargo in it. How Many Cubic Feet is a 12 Foot Truck? A 12 foot moving truck can hold about 450 cubic feet with a load capacity of around 3000 pounds. How Many Cubic Feet is a 16 Foot Truck? The 16 foot truck can hold around 800 cubic feet with a load capacity of about 4300 pounds. How Many Cubic Feet is a 22 Foot Truck? The 22 foot truck can hold around 1200 cubic feet with a load capacity of about 10,000 pounds. How Many Cubic Feet is a 26 Foot Truck? The 26 foot truck can hold around 1700 cubic feet with a load capacity of about 10,000 pounds.